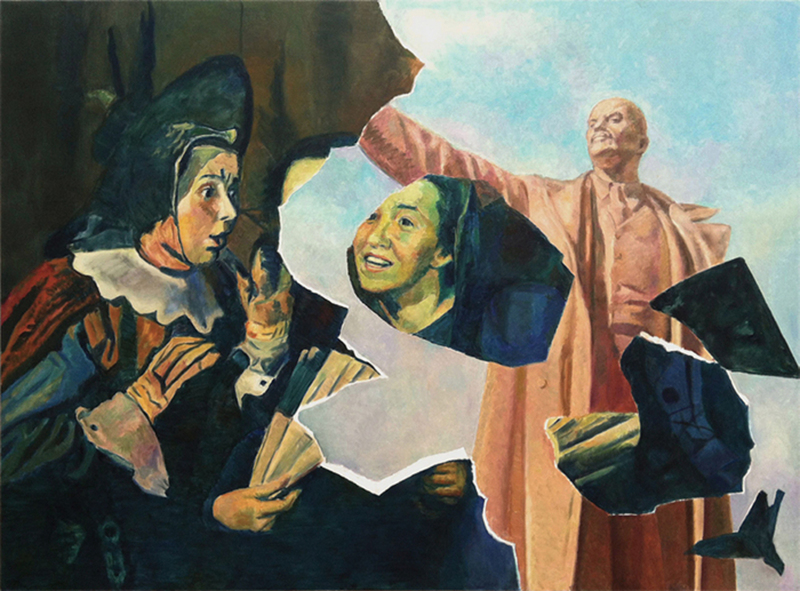 Ilya and Emilia Kabakov, The Appearance of the Collage #10, 2012, oil on canvas, 79 7/8 × 107 1/8". This retrospective will present a melancholy variation amid the year’s bountiful exhibitions dedicated to the centennial of the Russian Revolution. The Kabakovs are known for their virtuosic exploration of the gap between utopian promises and the humiliating minutiae of Soviet everyday life. Comprising more than one hundred objects and accompanied by an extensive catalogue, the exhibition begins with Ilya’s central role in Moscow Conceptualism and includes three ambitious installations. Its subtitle (named after one of the installations) derives from an episode, imagined by Ilya, in which Kazimir Malevich selected the artists who wouldor would notbe taken into the future. Yet the topicality of the Kabakovs’ trademark pathos may lie in this statement’s inverse. The revolutionary potential of the best known of their works (think of The Man Who Flew into Space from His Apartment, 1985) reminds us that everyone will be taken into some future, but that we may very well want out. 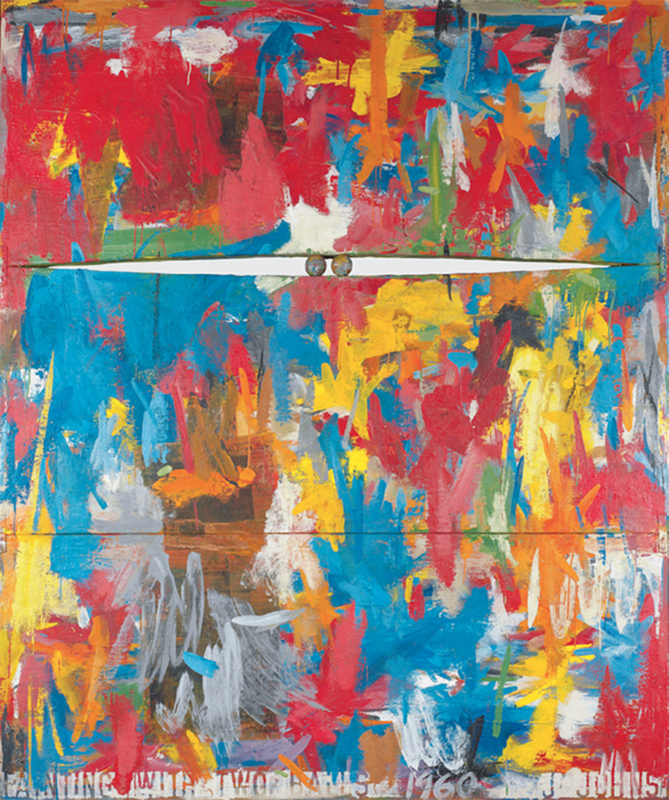 Jasper Johns, Painting with Two Balls, 1960, encaustic and collage on canvas, wooden balls, 65 × 54 1/8". © Jasper Johns/VAGA, New York/DACS, London. Some 150 paintings, drawings, sculptures, and prints by Jasper Johns will constitute a vast assembly that begins in the 1950s. In the early years of his career, Johns’s work was thought to reflect the consumerist boosterism that arguably infused Pop art. But he was also negotiating between abstract epistemesstripes, say, or hatchings, or catenary curvesand an abstruse iconography of mortality, elements of which Johns found in Edvard Munch’s Between the Clock and the Bed, 1943, or in the armor of the sleeping guards in Matthias Grünewald’s Isenheim Altarpiece, 1512–16. Johns’s most recent pictorial arcana, Regrets, derives from the shapes of a crumpled photograph used by Francis Bacon for a portrait of Lucian Freud. The exhibition’s title comes from one of Johns’s characteristically evocative utterances: “One hopes for something resembling truth, some sense of life, even of grace, to flicker, at least in the work.” Johns’s newest output continues to ally itself with the first bulbs of his luminous ascent to the highest reaches of American art some sixty years ago. And they keep burning.